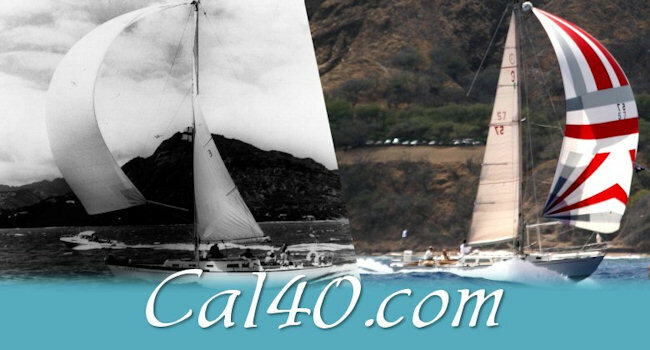 To help owners of Cal 40’s to enjoy their boats and compete equally in class racing. IT IS THE INTENTION OF THE CLASS RULES TO EQUATE THE SPEED CAPABILITIES OF THE BOATS IN CLASS RACING SO THAT THE SKILL OF THE SKIPPER AND CREW IN RACING AND TUNING AND MAINTAINING THE BOAT ARE THE MAJOR FACTORS IN WINNING A CLASS RACE. ANY DEVIATION FROM A STANDARD CAL 40 THAT IS NOT SPECIFICALLY PROHIBITED IN THESE RULES BUT WHICH DEFEATS THE SPIRIT OF THE CLASS RULES MAY BE PERMITTED IN CLASS RACING ONLY WITH THE WRITTEN PERMISSION OF THE ASSOCIATIONS GOVERNING BOARD. Every owner of a Cal 40 is current with his dues. President; Vice-President and Publicity Director; Secretary-Treasurer. With immediate Past President they will form the Governing Board. To govern the association as desired by the members. Elected by a majority vote of those members responding to a mail ballot or voting at the annual meeting. Approval of Class Rules and/or Amendments. By-laws, special assessments, special expenditures shall be by a majority vote of the association members. Mailed ballots must be returned within three weeks of mailing of said ballot. Each member shall have one vote. Proxy votes will not be permitted. Cal 40’s are eligible to race in class races if built by Jensen marine to the design by C. William Lapworth as a Cal 40 with no essential changes in the sail plan, rig, ballast or hull form. DISPLACEMENT: The sum of the bow and stern measurement, measured at the bow from the waterline to the top of the factory stem fitting (adjacent to the headstay), and at the stern from the waterline to the top of the taffrail (adjacent to the backstay), shall not exceed 97.0”. Other restrictions on displacement, such as bunk cushions, table, forward cabin door, etc., are waived. MAST: That the following modifications are acceptable: modern mast shapes, streamlined masthead assemblies, internal spreader-roots, internal tangs, and internal luff-groves. A significant reduction in weight is not acceptable. Spreader: 52” minimum from side of mast to tip. All Cal 40’s shall have bands painted, in color contrasting to the spars and one inch in width, on the mast and boom to indicate the maximum allowable luff and foot dimensions of the mainsail. Sails: Only PHRF (So. Cal) limitations will apply. Current US SAILING ASSOCIATION Racing Rules and offshore equipment list for the particular Race Category (1,2,3, or 4) will apply, as will the sailing instructions for the particular race. Each year the class shall hold a series of races to select that year’s class champion. High-Point Scoring for the Fleet Championships, 2005. If there are 5 Cal-40’s entered in a race, the highest placing Cal-40 will be awarded 5 points, and the lowest placing Cal-40 will be awarded 1 point. If there are 3 Cal-40’s entered in a race, the highest placing Cal-40 will be awarded 3 points, and the lowest placing Cal-40 will be awarded 1 point. If there is only one Cal-40 in a particular race, that Cal-40 will be awarded 1 point. The boat with the highest total will be awarded the Class Championship Trophy. Section 2. If no Cal-40s have raced in any of the “recommended races”, 1 point will be awarded for participation in any other race or races open to all Cal-40 owners. The boat with the highest total will be awarded the Class Championship Trophy. Under Section 2, the Cal-40 Class Rules will not apply. The winner of the Class Championship is entitled to have his sail insignia in gold and to have a “chevron” and the year of his championship on the sail in the vicinity of the class insignia. The gold insignia and the year of the championship follow the owner and not the boat. If the boat is sold to another, the gold insignia and the year of championship should be removed from the sail. A Cal 40 champion who might buy another Cal 40 may transfer his championship insignia to his new boat. a) Participation in a race (except for reimbursement of reasonable travel expenses). b) Developing, demonstrating, tuning or testing of sailboats, sails, rigging, or sailboat equipment. c) Teaching sailing or coaching sailing (except instructors in summer junior programs). 2) The crew-member-driver shall not have acted as a non-owner skipper or a non-owner primary driver (driving more than 50% of a race) in races other than “club races” or “fun races” in the past 12 months. (I.e., the races on our list are “club races” and “fun races”. NOOD, Gollison-North, the San Diego Yachting Cup, the “Big Boat” series, the Lipton Cup, etc., involve a higher level of competition, and would therefore fit this exclusion). The annual dues for membership in the Association are to be established by the Officers. Dues are payable to the Secretary-Treasurer prior to the Class Championship.